This report is a result of several months of collating information, researching the level of implementation of policy on treatment and disposal of waste, and assessing how well the objectives provided by the Strategic guidelines on waste management and the National environmental action plan have been fulfilled. In the first section of this document we present an analysis of the implementation and enforcement of two regulations in the area of waste management; the 1998 Rules on waste management and the 2000 Rules on waste disposal. 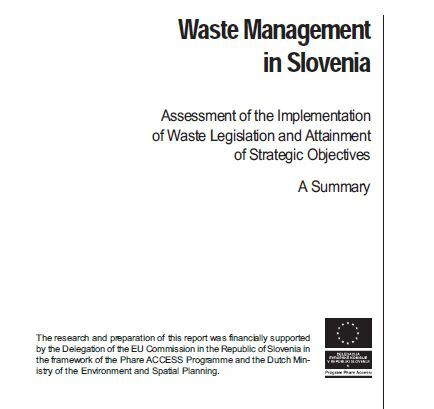 In the second section we present the analysis of the implementation of measures and attainment of objectives defined in the 1996 Strategic guidelines on waste management in the Republic of Slovenia and the 1999 National environmental action plan. During this analysis our efforts were limited to processes and objectives concerning communal waste. The third section presents a list of recommendations addressed to the government and the Ministry of the environmental and spatial planning; created from results of the review of implementation of legislation and the assessment of strategic objectives.